Our universal treated garden fence posts are suitable for all sorts of fencing projects, whether you are constructing a feather edge fence or using timber fencing panels. The timber has been pressure treated, meaning it has been deeply penetrated with preservative, ensuring it will resist rot for many years, even below ground level. 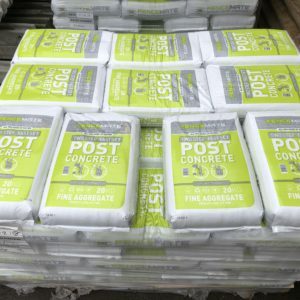 We deliver fencing posts to order, along with the required quantity of La Farge Blue Circle Postcrete, the quick-drying concrete that is ideal for anchoring fence posts into their post holes. (We recommend one 20kg bag per fence post). 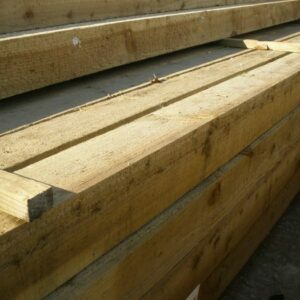 Our treated fence posts come in three different lengths – 1.8m, 2.4m, and 3m. If you have a different size requirement, please contact us and we will do our best to help. Generally, when putting up a fence post, the depth of the hole depends on the height of the post – at least a quarter of the post should be in the ground. When you have dug a suitable hole, keep the post upright in the post hole using battens, and a spirit level to ensure it is correctly aligned. Pour water into the hole to about a third of the depth. Then the post must be held firmly in place while you pour in the concrete powder evenly around the post, until all the standing water has been covered. Sprinkle some water on top of the concrete powder, and make sure the pole is level while the concrete sets, which takes around 10 minutes. Top up the hole with soil or a turf of grass.